I’m delighted to have this opportunity to talk for a few minutes about what the University of California, Irvine – also known as UCI – is doing to promote sustainable development. Let me start by giving a little background that will put the work we are currently doing in context. In the next few minutes I will talk about how the unique circumstances of our founding influenced our commitment to these issues, about our academic and research efforts, about how we have incorporated sustainability into the physical infrastructure and practices of the campus, about our regional partnerships, and our ambitions to expand our global partnerships. This is our campus. If it looks like a nice place to visit, you are right, and you are all invited. Like many of the universities represented at this conference, UCI is a relatively young institution. For four years in a row recently we were ranked by Times Higher Education the #1 university in the U.S. under 50 years old. A year and a half ago I became chancellor, and the next year we were longer ranked #1 under 50. What could I have possibly done wrong in just one year? Nothing. We just turned 51. It's OK. We have other recognitions. We are now the ninth-ranked public research university in the United States, tied with UC San Diego according to U.S. News and World Report. Last fall we were ranked #1 by the New York Times among leading colleges and universities for providing outstanding access and outcomes for students of all economic backgrounds. To put this point in context: UCI educates more students from low income families than the entire Ivy League combined, and their outcomes – graduation rates and employment – lead the nation. In the 1990s, shortly after we won our first two Nobel Prizes, we became the youngest university to be invited to join the Association of American Universities. We are also home to the west coast headquarters of the National Academies of Science, Engineering, and Medicine. We currently have about 32,000 students, and we are a comprehensive research university with the only academic medical center in our large county. But with respect to our origins, our campus is unique among the UC campuses in that it was not established in or near an existing city. UC Berkeley was established next to San Francisco, UCLA was established in Los Angeles, and so on, but UCI was established on 1600 acres of what was then empty rolling ranchland. We were named after a ranch, the Irvine Ranch, rather than a city. In fact, the City of Irvine was not founded until six years after UCI was. Both the city and the broader region were designed in conjunction with the campus. 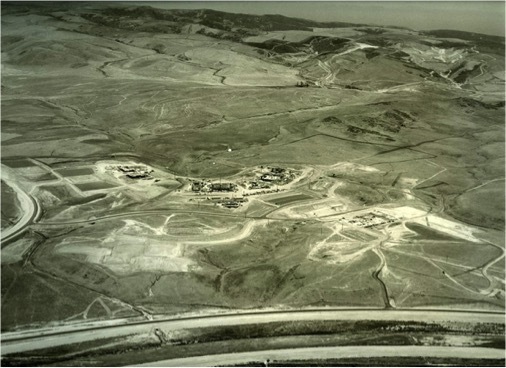 The sprawling Irvine Ranch – 100,000 acres stretching nine miles along the Pacific Coast and 22 miles inland – was going to be transformed into a highly livable and sustainable community, not just parks and nice neighborhoods, but forward-thinking policies on water management, energy conservation, open spaces and wildlife preservation – all the issues we are now addressing. From the beginning, campus researchers were part of an extraordinary experiment, reacting against the models of suburban development that were dominant in the 1950s and early ‘60s. 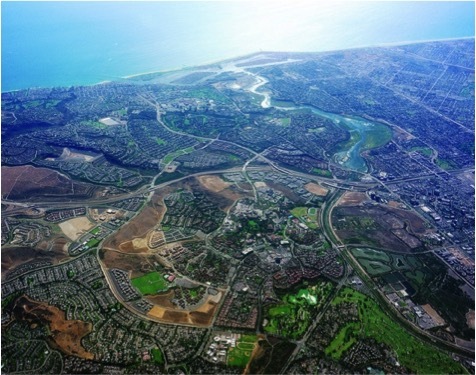 The university and the Irvine Company, together with architect William Pereira, best known for the Transamerica Pyramid in San Francisco and the distinctive “Theme Building” at Los Angeles International Airport, designed the Irvine Ranch Master Plan. Because of this plan, for our faculty and students, sustainability wasn't just one topic among many to study. It was an active part of the lived experience of how our campus and our region evolved. Fifty years later, our region – known as Orange County (yes, the home of Disneyland) – is the sixth most populous county in the United States, with more than 3 million residents. 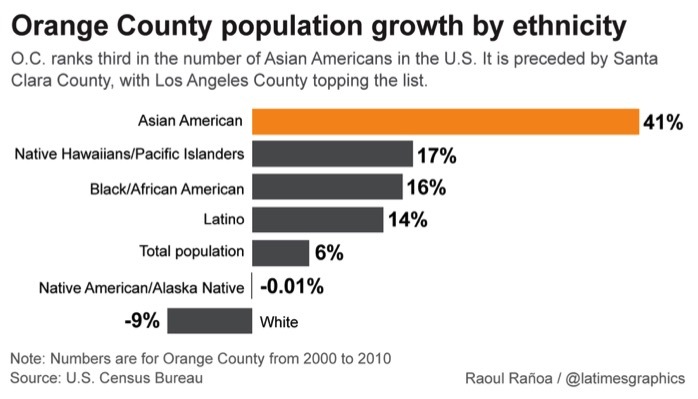 And by the way, given where we are gathered it is worth noting in passing that Orange County is home to the third-largest Asian American population in the United States. The city of Irvine has the county’s largest Asian American population, at almost 43 percent, and two Korean-heritage mayors in a row – the only city in the United States that can claim that. About 10 percent of our students are of Korean heritage. But back to our founding: from the beginning our campus focused on basic and translational research on issues relating to sustainable development and the protection of our environment. Not a bad accomplishment for so young a campus. Because of that legacy, and with the leadership of others on the campus – including our fourth chancellor, Ralph Cicerone, who is currently the head of the National Academy of Science in the U.S. – UCI established the country's very first Department of Earth System Science, devoted to advancing through teaching and research the fundamental scientific understanding of the Earth as a coupled system. This commitment to sustainability has also shaped the physical development of our campus. No university in the US has more LEED certified buildings than UCI. We have exemplary practices for water conservation and reclamation, echoing the world-leading practices of our regional water districts. Because of campus energy initiatives we use about 25 percent less energy now than we did eight years ago, despite significant growth on the campus. These solar panel installations illustrate some of our efforts. The U.S. Environmental Protection Agency recognized UCI with a 2014 Climate Leadership Award for Organizational Leadership for reducing carbon pollution and addressing climate change. 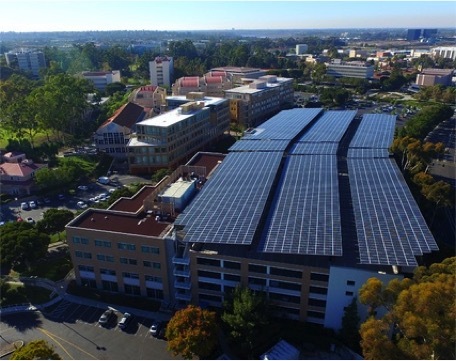 The award also recognized UCI for its Smart Labs Initiative, which reduced energy use in new and retrofitted research laboratories by an average of 60 percent. UCI’s Smart Labs program also received California’s highest environmental honor, the Governor’s Environmental and Economic Leadership Award. 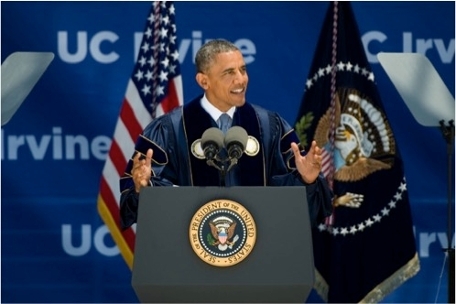 These are some of the reasons why President Obama, speaking at our commencement in 2014, said we were “ahead of the curve” when it comes to sustainability. We have been just as active on the academic side. UCI faculty members from across campus offer more than 110 sustainability courses and an additional 139 courses that include sustainability. About 45 percent of our undergraduate degree candidates are exposed to sustainability learning in the classroom. But it is still in the research arena where we are having the greatest impact. 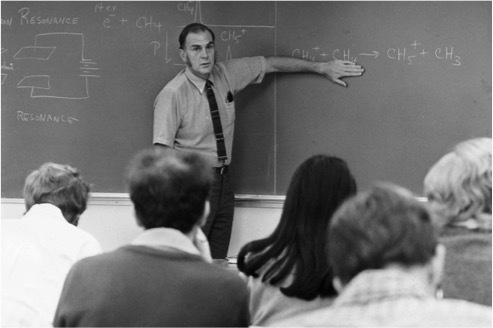 We have established several university-wide, cross-disciplinary academic initiatives. For more information you can visit the website sustainability.uci.edu. You'll see that we have 47 research centers, institutes, and programs that address sustainability and climate change issues – including the National Fuel Cell Research Center. Two hundred thirty-four faculty in 36 departments in 13 schools conduct sustainability research. 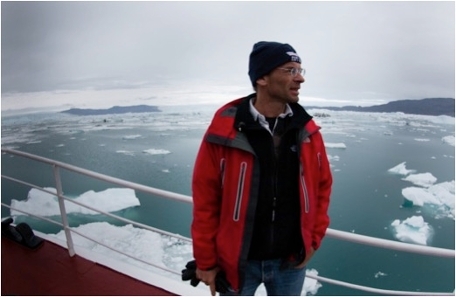 One example you might have been hearing about this past year: Professor Eric Rignot has found that the warming of the ocean is causing most of the ice shelf loss in Antarctica and Greenland. Another UCI researcher, Jay Famiglietti, documents how climate change is causing groundwater depletion and droughts; his work spans from California to the Middle East. The list can go on. Our regional partnerships also facilitate our research mission. 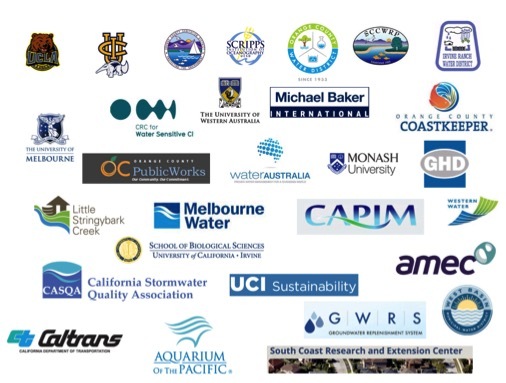 Our biologists do research in our county's nature reserves, our water policy experts work with our local water districts, our climate change & coastal communities group works with coastal cities to anticipate changes in flood zones and develop responsive plans. 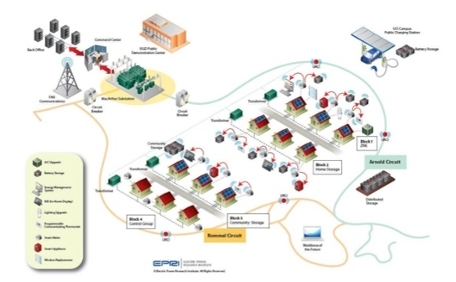 This slide represents our partnership with the U.S. Department of Energy and Southern California Edison, our local electrical utility, in using a residential portion of our campus to study and evaluate a variety of existing and new smart grid technologies, with the overall goal of developing zero-net-energy homes. The programs and practices I have mentioned, and all the ones I haven’t, have led the Sierra Club, the U.S.’s leading non-governmental environmental group, to name us the number one “greenest” college or university in the U.S. for two years in a row, which is a source of pride for us, because every campus in the country claims to have a strategic focus on these issues. So we’re devoting a significant portion of our academic enterprise, and our institutional practices, to increasing sustainability and mitigating climate change. Are we doing enough? In a word – no. Consequently, our new strategic plan calls for us to increase work in this area (and also to expand the impact we are having in integrated health sciences, convergent science, and tech transfer). Importantly, our plan calls for us to increase our international partnerships. This is the next step for all of us. The problems are too big, too multi-dimensional, too important for any one of our faculties to address on their own. My campus can handle some of our regional issues. But when the scope of the challenge is global then our approaches must be as well. Of course our researchers already have global partners. For example, as you know, California is currently suffering from a severe drought, and Australia has been coping with drought conditions for more than a decade. Under a National Science Foundation program called Partnerships for International Research and Education, or PIRE, we have created partnerships with Australian universities and organizations to advance research in this critical area and to develop and promulgate innovative and effective policies and technologies to better manage water resources. But there is so much more that must be done, to address challenges we are all facing – air quality, energy efficiency, alternatives to fossil fuels, healthy and safe living environments. We are all here because we know it is imperative that we find ways to expand existing bilateral and consortial partnerships. Many members of our faculty learn on their own about work being done at other institutions, but too many opportunities for collaboration are missed when we rely merely on these organic, bottom-up relationships. I am looking forward to conversations about how we can develop more effective mechanisms by which more members of our faculty can learn about each other's work and propose initiatives that can have an even more profound and positive global impact.